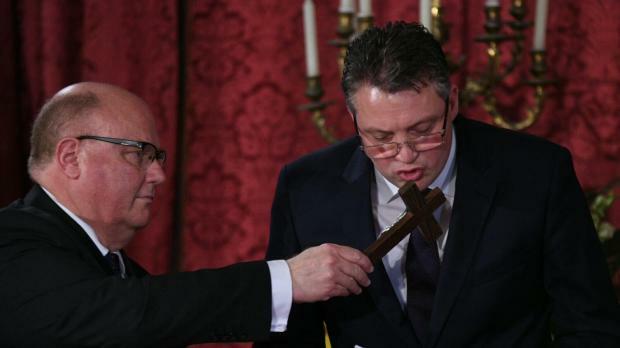 Fourteen ministers and 10 parliamentary secretaries took their oath of office at a Valletta ceremony presided by President Marie-Louise Coleiro Preca this afternoon. As Prime Minister Joseph Muscat looked on, the 24 selected MPs took it in turns to pledge to fulfil their duties "without fear or favour" while upholding the Constitution. Dr Muscat and his newly-appointed ministers will form Malta's newest cabinet, with parliamentary secretaries attending the top-level executive branch meetings upon invitation. Speaking to Times of Malta following the ceremony, Dr Muscat said this Cabinet would face very different challenges to their predecessors. "In our first legislature we faced stagnant growth, rising unemployment and high tariffs. Now we are in the midst of a continued economic boom." He highlighted social housing and bureaucratic bottlenecks as two areas which would require more attention during this term. The Prime Minister's latest Cabinet includes two more parliamentary secretaries and two fewer ministers than his previous one. Noticeable by their absence are former Gozo Minister Anton Refalo, who reportedly refused any other Cabinet post, as well as former ministers Edward Zammit Lewis and Manuel Mallia. Dr Zammit Lewis and Dr Mallia both failed to get elected, with the same fate befalling former parliamentary secretaries Deborah Schembri and Stefan Buontempo. Some key portfolios have been kept unaltered - the Finance, Health, Economy, Justice, Education, Equality and Environment ministries will all be led by the same ministers - while in other cases portfolios have been reshuffled or replaced. Ian Borg, who previously served as parliamentary secretary for the EU Presidency, EU Funds and electoral manifesto implementation, will now lead a super-ministry responsible for transport, infrastructure, capital projects and planning. Joe Mizzi, formerly Transport Minister, will now be the minister responsible for energy projects, replacing Konrad Mizzi, who has been made minister for tourism. The Home Affairs portfolio has been handed to former family minister Michael Farrugia, with Carmelo Abela being moved to Foreign Affairs following George Vella's retirement. Dr Farrugia's former portfolio will now be managed by newly-sworn in minister Michael Falzon.